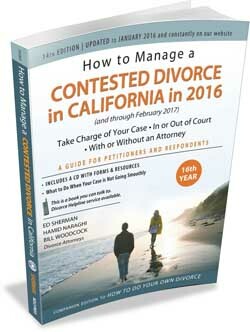 For the past 13 years, until 2016, California attorney and author Ed Sherman has been publishing his California contested divorce book under the title How to Solve Divorce Problems in California, with the subtitle How to Manage a Contested Divorce—In or Out of Court. But when it came time to update the book for 2016, Ed decided it was time to make some major changes. So not only did he change the title to How to Manage a Contested Divorce in California in 2016, he brought in two new co-authors, top California attorneys Hamid Naraghi and Bill Woodcock. 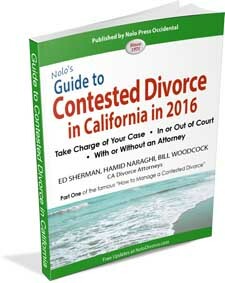 With extensive experience from thousands of cases handled in their Divorce Helpline practice, and in their litigation law firm Nader, Naraghi, & Woodcock, APLC, Hamid and Bill were able to provide new insights and strategies to the text of Nolo’s 2016 contested divorce book. How to Manage a Contested Divorce in California is not a stand-alone book. It is added to Sherman’s famous How to Do Your Own Divorce in California to form a complete kit for a contested divorce. If you and your spouse can cooperate and agree on how you want to settle all the issues in your divorce, such as property and debts, parenting, child and spousal support, then all you need is the the Do Your Own Divorce book. The goal of both books is to keep your case out of court as much as possible. 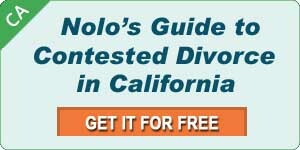 In fact, Nolo is now offering the first two parts of How to Manage a Contested Divorce in California as a free e-Book called Nolo’s Guide to Contested Divorce in California. This eBook shows you how to solve problems out of court, and how to prepare and conduct your case. Preparation is key, as this is where cases are lost or won. Part Three of How to Manage a Contested Divorce in California shows you how to plan and take your case to court yourself or you can use it to supervise an attorney you hire to take your case to court for you. Chances are good that after reading our free eBook, Nolo’s Guide to Contested Divorce in California, you will be able to avoid court.